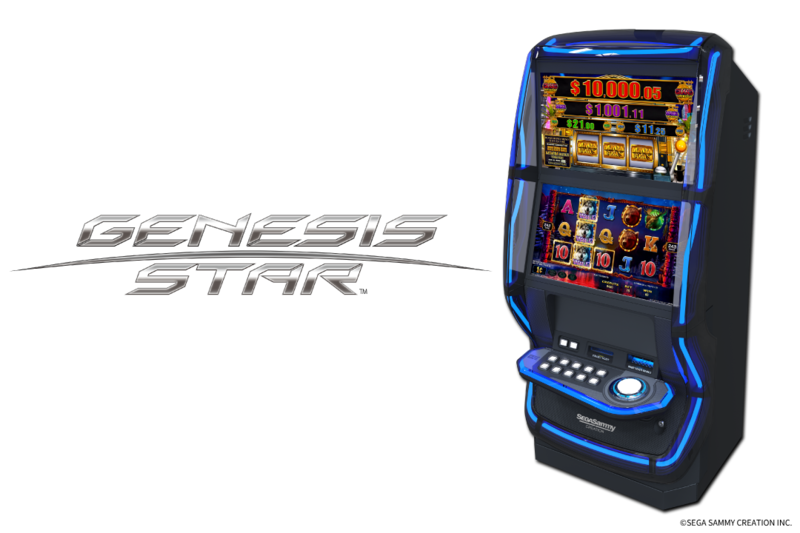 INNOVATIVE NEW CABINET, “GENESIS STAR”｜SEGA SAMMY CREATION INC.
SEGA SAMMY CREATION INC. (Headquarters in Yokohama, Japan, President: Hisao Oguchi) announced today that they have released their new “Genesis Star” cabinet. The cabinet has two unique features: a patent applied LED lighting system that gives the image of classic neon lighting that will attract players’ attention and react to games scenes, and a play button that features an industry-first vibration system and full color LED lights that also react to game scenes. Cutting-edge technology was used to develop the LED lighting that is not only very different from any of the competition’s cabinet lighting, but also resembles neon in a way that gives the cabinets a classic, nostalgic feeling and provides the player with a more immersive experience. The Genesis Star also features dual HD monitors with an integrated touch screen, a control panel to decrease a player’s physical stress when pushing the buttons, and a slide belly door designed for easy maintenance access. There will be a diverse line up of themes that can be played on the Genesis Star and Slant cabinets including some based on SEGA’s video games which are incredibly popular and played around the world. The Genesis Star will be introduced at major casino facilities in Macau SAR, China and across Asia this year.